The Guadalupe Parador uses the buildings of the former Hospital of St. John the Baptist, a historical 15th century building. The comfortable, friendly Parador has whitewashed arches adorned with vegetation and many of the ceilings are rough-hewn timber. The public rooms have ancient maps, engravings and tile plaques. There are also low copper braziers once used to warm the pilgrims who came here to worship at the shrine of the Virgin of Guardalupe. 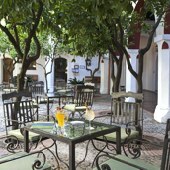 A courtyard with citrus trees surrounds the Parador and there are also views across the patio to the garden and the secluded swimming pool. There is also a tennis court in the garden. The simple but delicious local cooking is served in the restaurant. There is also a special menu for those on a glutin free diet. The 14th Monastery is the most impressive attraction of this city which has been declared a National and Artistic Monument. It was founded by King Alfonso XI after the Battle of Salado. In Guadalupe a visit should be made to the museums of fabrics and miniatures and also the San Jeronimo Chapel. Trujillo deserves a visit and las Villuercas makes an interesting excursion.. The Feast of Virgen de Guadalupe is held every 8th of September. The ”Romeria” (pilgrimage) to Mirabel is on May 3 and the ”Hispanidad” (Columbus Day), on October 12. The Monfrague National Park is an ideal environment for walking, cycling, riding and fishing. The Parador of Guadalupe has twenty six twin bedded rooms, fourteen rooms with a double bed, one single room and one suite, all of which have a private bathroom. Every guest room has a telephone, satellite television, safe and a mini bar. The Parador has air conditioning, central heating, restaurant and bar, currency exchange, lift, garage, cable TV, piped music, garden and seasonal swimming pool. Facilities are available for business meetings. Distance from the nearest train station is 65 kms. Stayed for 2 nights in October with my wife and we really enjoyed our stay. The setting is lovely just a step away from the plaza mayor where there was always something interesting happening. Staff were helpful and friendly while the Parador itself was very comfortable in a beautiful historic building. Drivers be advised that parking in the courtyard can be tricky at busy times but don't be put off. The staff will look after moving the car if you have to double park! In september 2014 we toured the route de la Plata and visited several Paradores hotels. This was a great experience. Very nice hotels, good restaurants, excellent service, nice locations. Price / quality ratio was also very good. Higly recommendable. Hans and Jenny van Bergen. I stayed here on a stop over from Leon to Faro. It was just fabulous. The setting is amazing, the mountains, the flowers, the wide vistas, the birds, the sky. The journey itself was enough to make you feel poetical. The village is a real gem, and was thronging with people when I arrived because there was a major festival on. 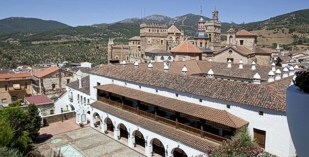 The parador itself was easy to find, (with a sat nav), parking was good, the room was fabulous, I really was impressed. Reception staff couldn't have been more friendly, and didn't mind as I stumbled through some O level Spanish as practice. Restaurant food was very good, great choices, nice wines. I would strongly recommend it - and have done so. We have been to Spain many times and most of the time we stayed in Paradors. It is a great idea and very nice system. We stayed at the Parador at Guadalupe last October. It is a beautiful place and the location is great. The only problem was dinner due to few guests at the Parador. Nevertheless we highly recommend it. Parador hotel of Guadalupe in in a converted sixteenth century building.